Nancy J. (Galica) Underwood, 75, of Chicopee, died peacefully with her family by her side on Wednesday, February 6, 2019 at Mary’s Meadow in Holyoke. Nancy was born on May 14, 1943 and was the daughter of the late Francis and Matilda R. (Skowyra) Galica. 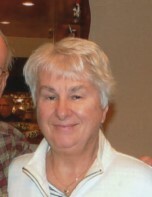 She was a 1960 graduate of Chicopee High School and a 1962 graduate of Bay Path Junior College. Nancy received her Bachelor’s degree in Education from American International College in 1978 and her Master’s in Computer Science from Framingham State College. She was an elementary school teacher at Belcher School in Chicopee for twenty years. She was a communicant of the Basilica of St. Stanislaus Bishop and Martyr, a member of the Rosary Society and a Pierogi maker. Nancy was a member of the Polish Junior League, Polish Women’s Alliance, the Mermaids at the Elms College and Massachusetts Teacher’s Association. She enjoyed volunteering and entertaining her friends and especially family during the annual Polish tradition of Wigilia. Nancy is survived by her beloved husband, Gerald T. Underwood; three daughters, Lynn McCormick and her husband, John of New York, Pamela Stad and her husband, Chris of North Andover and Jennifer Underwood and her significant other, Chandler Brill; three sisters, Carol Lak and her husband, Les, Joyce Reed and her husband Roger and Donna LaPierre ; beloved grandchildren, Jett Stad, Luke Stad and Natalie McCormick; brother-in-law, Michael Underwood and sister-in-law, Joan Underwood. She also leaves many cousins, nieces, nephews, friends and neighbors. Nancy’s family sends a very heartfelt thank you to all the staff at Mary’s Meadow and Trinity Hospice for their loving and compassionate care during Nancy’s eight month battle with glioblastoma. Nancy’s funeral will be held on Monday, February 11, 2019 from the Cierpial Memorial Funeral Home on 61 Grape St. in Chicopee Center at 9am, followed by a Liturgy of Christian Burial at the Basilica of St. Stanislaus at 10 am. Burial will be in St. Stanislaus Cemetery. Calling hours are on Sunday from 2 to 5 pm. Memorial contributions may be made to St. Stanislaus School, 575 Front St. Chicopee, Ma 01013.